There are so many big things to love about jackfruit, we almost don’t know where to start. How about with the fact that the amazing tree not only produces the largest tree-borne fruit in the world, it also produces tons of them? Literally. 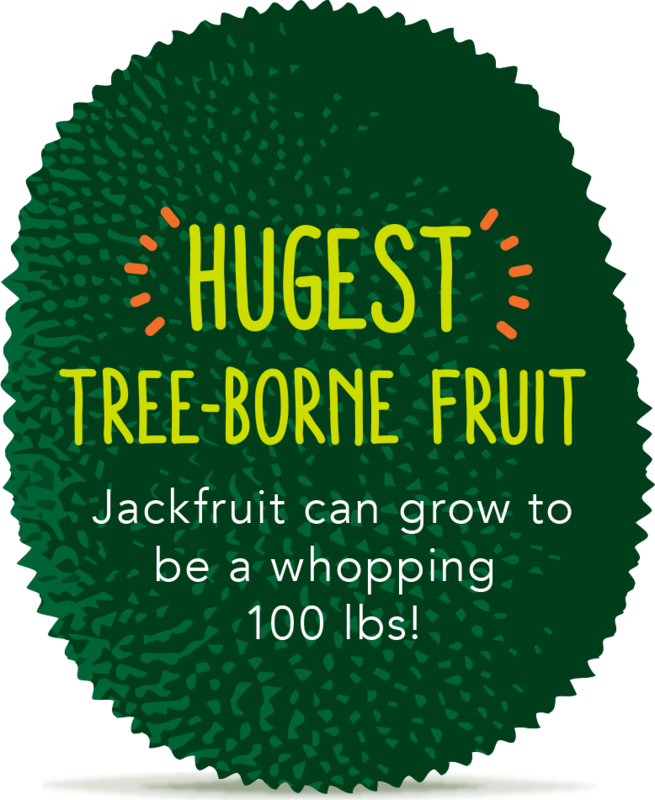 Because one jackfruit tree can produce up to 200 jackfruit a year, and each jackfruit can weigh up to 100 pounds. The jackfruit tree is also hardy, easy-to-grow, and resistant to drought and heat, so it’s well suited to adapt to our changing climate. And though they’re native to southern India, jackfruit trees thrive in tropical regions around the world, which is why it’s a staple ingredient in many Asian cuisines. 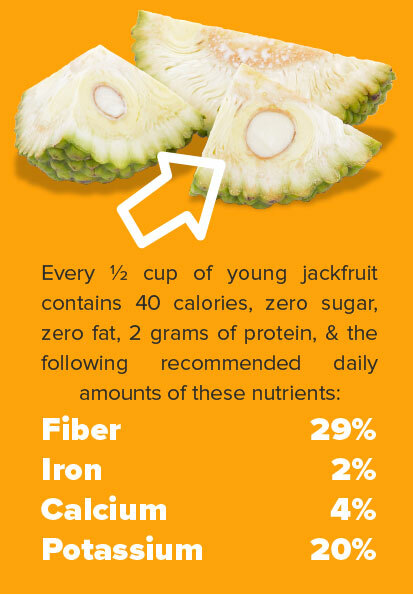 But of course, the biggest deal of all about jackfruit is that it’s nutritionally dense and unusually versatile. Jackfruit is high in sustaining fiber, low in calories, and has a texture and flavor that evolves during its ripening process. The flavor of young jackfruit is subtle, so it absorbs and complements the spices and seasonings it’s cooked with. It also has a meaty, dense texture that shreds like pulled pork (the Bengali word for jackfruit means “tree mutton”). This makes young jackfruit a wonderfully versatile centerpiece for plant-based diets in nearly every cuisine—from spicy Asian curries to savory southern BBQs to comforting Italian pastas. And as jackfruit becomes more mature, it softens, sweetens, and its flavor becomes more distinctly tropical–like a blend of pineapple and banana. Fully ripened jackfruit is the perfect ingredient for smoothies, fruit salads, and frozen desserts. The only drawback of jackfruit also happens to be one of its virtues: it’s huge (have we mentioned that?). Which means fresh jackfruit is a challenging choice for individual consumption. Walking home from the market with a piece of fruit the size of a baby hippo in your shopping bag? Not so easy. On top of that, just slicing and storing even a small jackfruit can easily take four hours. And you probably have better things to do with your afternoon. And that’s where we come in! We’ve devoted ourselves to overcoming every obstacle that gets in the way of your pure enjoyment of this amazing fruit. We take care of all the sourcing and preparing (and we do it with exceptional flair, if we may say so ourselves), so you can conveniently enjoy jackfruit and all its delicious benefits, ready to eat in the comfort of your own home. Versatile flavor, satisfying texture, and naturally wholesome nutrition–you can see why jackfruit really is the jack of all foods, in a big way.